LE SERVICE – Professionnel et très rapide, le service offert par cet établissement vous assurera un repas sans le moindre problème, un gage de qualité et de sérieux qui vous donnera l’envie de renouveler l’expérience. COPIEUX – Si vous aimez les assiettes bien servies, alors vous venez de trouver un nouveau restaurant à ajouter à votre carnet d’adresses, des portions très généreuses qui conviendront parfaitement aux gourmands. LE DRESSAGE – Le dressage des assiettes du restaurant Costa D'Amalfi vous surprendra certainement, qu’il s’agisse de la forme ou des couleurs, vous aurez affaire à un véritable sans faute ! Superb definitely recommend great with the kids too, lovely atmosphere. The starters were not at all nice (beef maki was so cold, almost frozen... carpaccio of fish was not tasty at all), main dishes were better (mainly meet) but still below the expectations we had while reading such nice reviews.... very good wine. Very kind waiters. Excellent kitchen but disappointing atmosphere. It was cold and uncomfortable for a dinner. However food was delicious so 9/10 for the chef! This was the highlight of my trip to Brussels. A warm welcome, great food on a wet and cold night. Was worth walking in the rain ! Very gluten free friendly and fun staff. Not so bad but not good. This is not the first time I visit this restaurant, and it will not be the last. Very good, real Italian food served by Italians. Great wine card! The staff knows the wines they sell. Fantastic pasta and great antipasti. No pizza. The owner helps with service and looks after his clients - including a limoncello at the end of dinner. We had a wonderful experience at Costa D'Amalfi. The environment made us feel as if we were in Italy. The entrées were quite good but the dishes were amazing! I definitely recommend it. Amazing octopus as starter and very much recommending to try the pasta with pistachio sauce! The panacotta with forest fruit coulis was also very tasty. 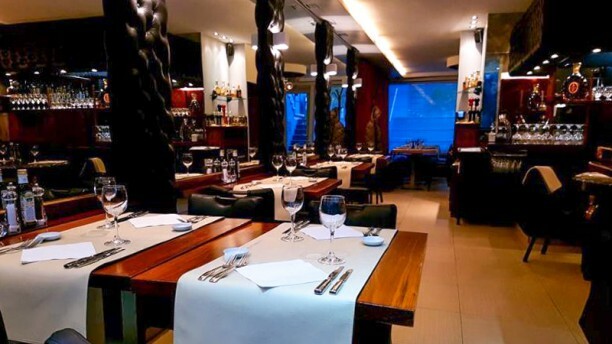 This is a small, cosy restaurant with informal atmosphere and presenting Italian cuisine above standard. Menu is quite short, but does not include average spaghetti dishes or pizzas. All that we tasted had original flavours and literally melted in our mouths. There is a good selection of Italian wines and liqueurs. Hosts are welcoming and if you are a football fan, you are sure to have an interesting conversation with the owner. Carrot and Ginger soup was excellent. The English version of the menu said that the main courses were served with mashed potatoes and vegetables but arrived with just one small boiled potato and one small carrot. The portion size was generally very small. We had just 2 courses and the cheapest Barolo on the wine list and the bill came to over 150 Euros. Great food. Dessert was excellent. Always Nice when everyone in the staff talking Italiano. Excellent Italian cuisine, and that's coming from an Italian. Very elegant yet cosy atmosphere. We had smoked burrata, truffle ravioli, scialatielli with clams and courgette flowers, swordfish with puréed aubergine, and a bottle of water. The food was delicious, and the bill was 84 euros. We're definitely going back. We are from Canada travelling through Europe. We booked the restaurant for my husbands birthday and indicated this under spaecial notes and also in person I mentioned it to our waiter. There was no acknowledgement of his bday. Even a “Happy bday to you,” would have been nice. We asked to be seated in their best seats. We were seated in the back corner, there was nobody else inside the restaurant at 730pm. When we left there were 3 others only. We can hear people sitting outside though, it sounded much more lively. Poor ambiance. The food was just ok, presentation was good, but I wouldnt go back. The wine we had was great though- we had a merlot. Average service, however this is the norm in Brussels. Nobody asked if we wanted to order dessert. Very good food, well prepared. Good service. All in all very worthwhile.